Thick. Creamy. Dreamy. Nutritious and satisfying. 4 ingredients and 3 minutes later and I had myself a super tasty vegan pudding. Kabocha squash and persimmons being two of my favorite seasonal produce items, I cannot believe this is the first time I combine them. I had just gotten home from a workout and was going to be working shortly after. I needed something quick and satisfying. This was it. I love it when I can get away with eating something after a workout that seems like it should be had for dessert. I would have this pudding at any time of day really. Persimmons being super high in vitamin A (Good for eye sight, and skin as well as mucus membranes), as well as vitamin C (great for the immune system and mucus membranes). Kabocha squash has half the calories of butternut squash, yet double the richness in flavor in my opinion! It is also very high in vitamin A and C and beta carotene (powerful antioxidant and anti inflammatory). 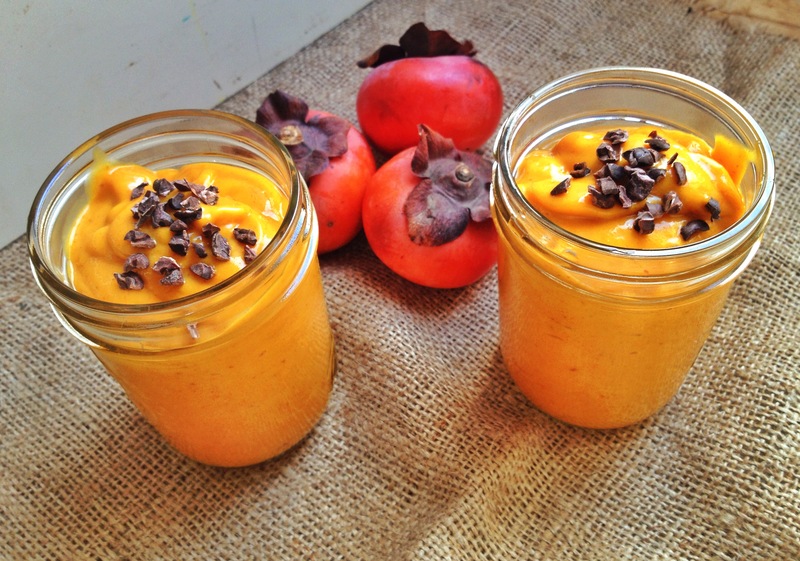 Needless to say, this pudding is a great way to get a good dose of vitamin A and C !